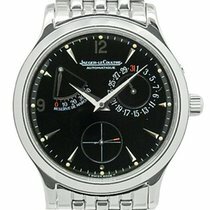 Up for sale is this stunning Jaeger Le Coultre wristwatch which is in all round mint condition and has been fully inspected by our in house watchmaker. 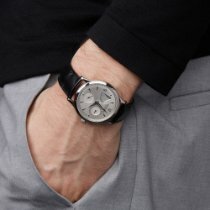 The watch measures 37mm excluding crown by 43mm from lug to lug. 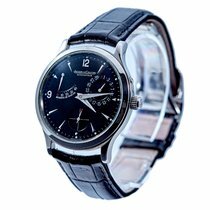 stainless steel case, Jaeger Le Coultre crown, screw on back, sapphire crystal glass which is clean unmarked, powered by a high quality Jaeger Le Coultre jeweled automatic movement and is in clean condition and in good working order keeping time well. 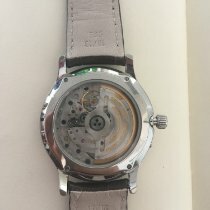 The attractive silver dial with raised silver hour markers, silver luminous hands, power reserve indicator, date indicator, sub seconds, there is a slight mark center of dial, fitted on original brand new black leather strap, deployment clasp, and comes complete with box & papers guarantee dated 03 March 2000.